Today’s post is about a report from the Centre for Policy Studies, which claims that the State Pension is unfit for purpose. The State Pension is in the news at the moment. 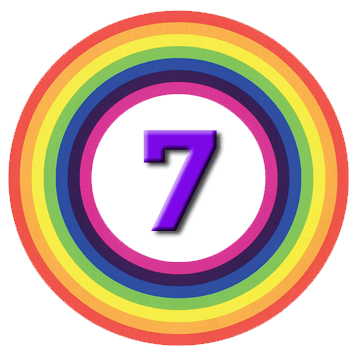 The new State Pension scheme went live in April 2016, and a couple of weeks ago we had the Cridland interim report on the future of the State Pension (aimed largely at working out how fast the qualification age – retirement age – should rise. Now we have a new report from the Centre for Policy Studies which claims that the State Pension is no longer fit for purpose. This is strange considering that the Cridland report concluded that the State Pension would remain affordable for another 50 years. 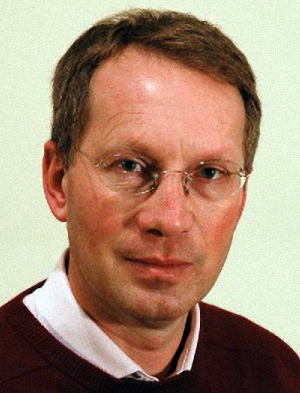 The author of the new report is Michael Johnson, who we’ve met several times before. Back in March 2015 we looked at another of Michael’s papers which claimed that pensions are finished. And in June 2016 he produced a report recommending a Workplace ISA as a stablemate to the Lifetime ISA (of which I am not a fan) and the new auto-enrolment (AE) workplace pension. Let’s take a look at a few of the points that the CPS makes this time. This is a red herring, and the wrong way to look at pension funding. It’s a pay as you go system, with the current generation of workers funding the current generation of pensioners. The amount paid in will rarely line up with the amount paid out. Depending on the demographics, you will either have a surplus or a deficit. Given the rising numbers of baby boomers about to hit pension age, we are likely to see deficits for a number of years. This doesn’t undermine the funding mechanism. The Cridland report instead used a percentage of GDP (8% in fact) as a funding target. 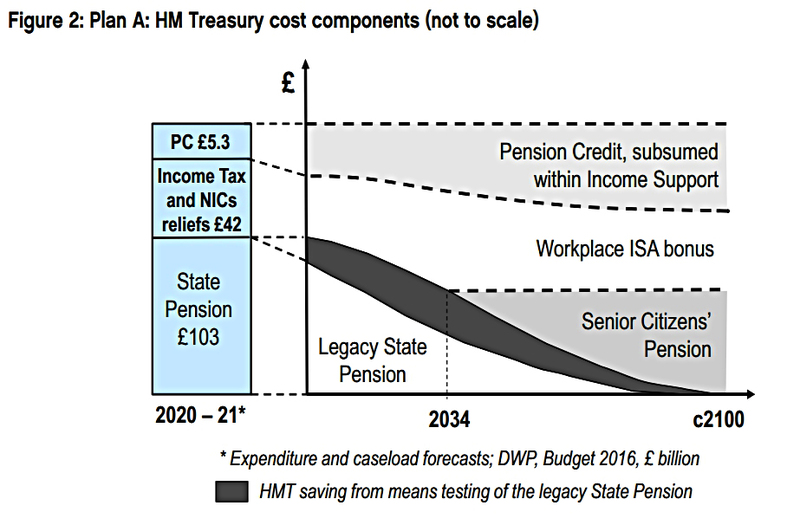 Cridland reported that the cost of the state pension would remain below 8% of GDP for the next 50 years. The CPS wants to get rid of the idea of a single state pension age (SPA) for all. But they think that personalised pensions would be expensive to administer, highly contentious and potentially litigious. The “issue” here is that because wealthy people tend to live longer, they will receive more in pension payments. Ignoring the fact that the wealthy are also likely to have paid a lot more NIC and tax into the system, the State Pension doesn’t guarantee the same amount of payments to everyone. It’s an insurance scheme against living too long (longevity risk). The promise is that for every year you are alive beyond a minimum age, you’ll receive a maintenance grant. Life expectancy depends on many factors, some of which are under an individual’s control. If we start penalising people for making good choices (healthy eating, moderate drinking, not smoking) we are starting off down a slippery slope. The CPS makes a number of proposals to “fix” the State Pension, under two separate plans – Plan A and Plan B. 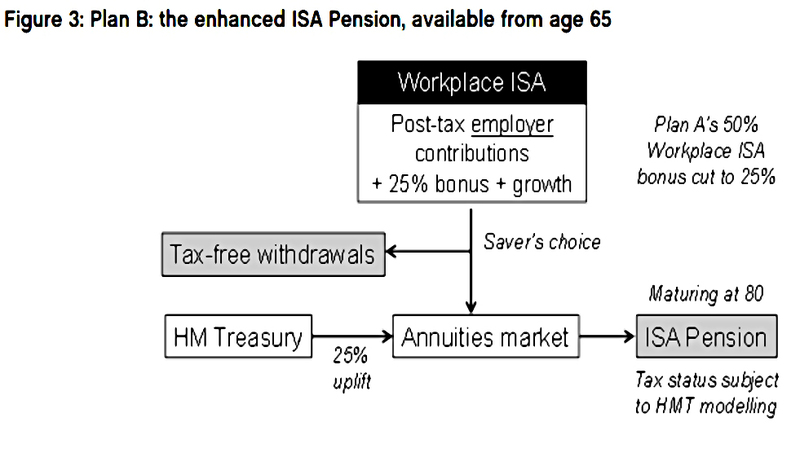 Income Support should be extended beyond the SPA, so that Pension Credit can be scrapped. I find it highly unlikely that these proposals will ever be adopted, but let’s imagine for a moment that they are. I’m 56 years old, so I’m a reasonable guinea-pig to test what would happen. At the moment, I’m 10 years from receiving a State Pension of close to £8K. I already have around £7K from past contributions,1 and my part-time work over the next 5 years or so should lift that to around £8K. Under the CPS plan, I will be able to get close to the £8K qualification by 2020, and will still receive this pension (LSP) at age 66. But oh, no – I won’t get anything because the LSP is now means tested, and I’ll be too rich to qualify. Never mind, at age 80 (in 2040), I might get the SCP, since I will have 40 years residency (50 actually) from age 30 to 80. But maybe I wouldn’t even get that, because perhaps the SCP qualification clock will only start running from 2020. So it’s quite likely that 40 years after starting to pay towards my State Pension, and 10 years from receiving it, I would suddenly be told that I get nothing. That puts the current WASPI controversy into perspective. My one consolation is that I am old enough to have saved into a SIPP with tax relief on the contributions. Even here, I would have to rush to take my 25% tax-free lump sum before the CPS snatches that away. It’s not fair to those of us who have made decades of NIC payments in the expectation of receiving a State Pension. It’s not fair to those who live well and hope to live long compared to those who shorten their own lives through bad choices. The AE workplace pension will probably not provide a large-enough pot for people to live on from 65 to 80, and the new SCP of £10K will not provide an adequate standard of living after that. On top of all this, there’s no need to change the existing State Pension, since the interim Cridland report has indicated that it will remain affordable for many decades. 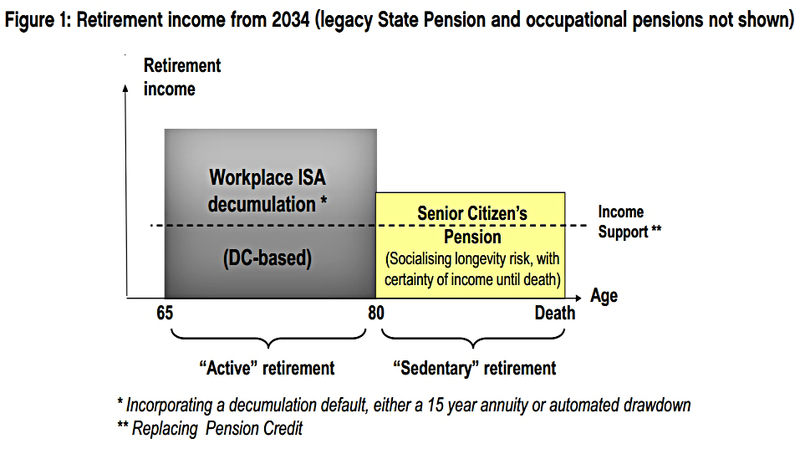 In the worst case, the State Retirement Age will rise gradually from the current 67. Luckily, the CPS report hasn’t gone down well. Tom Selby of AJ Bell said that the proposals would cause “uproar” and “riots in the streets”. Fairly genteel riots perhaps, since most of the protesters would be over 50, but I think you could count on a few strongly worded letters to the press and to MPs. He’s basing his conclusion on the reactions to recent moderate increases in the SPA (from 60 to 67 for women, and from 65 to 67 for men). The simplicity of the new, [fixed State Pension] system is appealing while [the CPS’s] proposal is complex and has many parallels with the system the government has just done away with, whereby people built up both a basic and second state pension based on their own NI contributions. Former pensions minister Ros Altmann called the proposals “dangerous, retrograde and wholly misguided”. She said that means-testing “misunderstands human psychology” and would disadvantage the “majority of the country”. It would undermine incentives to save and help the privileged few at the expense of ordinary people. I’m pretty sure that I’m one of the privileged few that she’s talking about, but I can’t see how the plans help anyone that much. She also points out the irony of the CPS calling for the abolition of the State Pension when we are only six months into a new scheme which will fix many of the problems with the system it replaces. The legacy of contracting out, and of equalising state pension age between the genders means that the New State Pension will continue to get bad press. But it will also be a big improvement over time, and we should stick with it. We look at the interim report from the State Pension Age Review, which was published last week.